During the recording process you are able to annotate your presentation by means of drawing, create pointers and writing on screen (max. 500 characters). In this chapter we will explain how to do so. To be able to draw on screen we first have to start recording. Please press the “Start Recording” button. 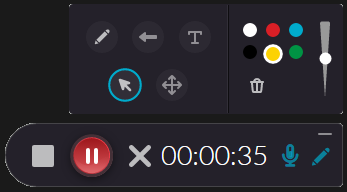 Now that the recording has started you can press the white pen icon on the far right of the recording controls. A new popup opens with various controls for what you can do on screen. It has the pointer enabled by default (which can be determined by seeing the blue circle around the mouse pointer icon). 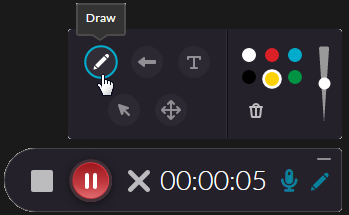 Select the Draw button as shown in the screenshot below to draw on screen. This option allows you to draw on screen freely. Select the Arrow button as shown in the screenshot below to draw arrows on screen. 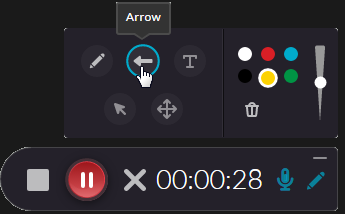 This option allows you to draw arrows on screen which can be used to point something out on screen more easily than drawing a arrow by hand. Select the Text button as shown in the screenshot below to write on screen. This option allows you to write on screen to add comments to what you are showing your audience. Color picker: choose what color your annotation will be in. Size slider: choose what size the annotation will appear in. Clear: Clear all annotations from screen. Finally we have the “Select” option (see screenshot below). 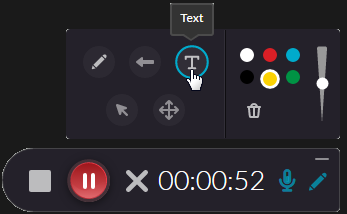 This option allows the user to drag annotations across the screen. Once selected you can choose to delete the currently selected annotation by pressing the delete or backspace button on your keyboard.